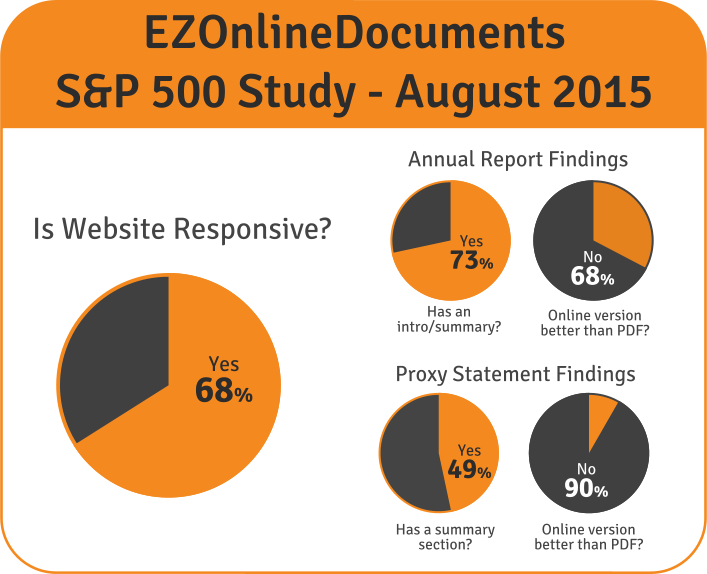 In 2015, EZOnlineDocuments started an annual study of the behavior of each company in the S&P 500 to see how they stand in using current web technologies when communicating with their investors. This page includes our own analysis, but also utilize the data itself and do your own filtering and assessment. You can zone in on many important types of information such as if the company has a responsive web site, a responsive IR site, and if their documents are catering to mobile (iPad, tablet and smartphone) users. In 2015 it is important to note the dramatic shift towards responsive websites - meaning that the company's website is mobile friendly and displays content properly on all devices. This can be a challenging task for companies, yet adoption is already at a stellar 68%. This shows how important the task is, which is validated by the huge trend towards mobile use by consumers with nearly 50% owning a tablet and 78% owning a smartphone. (For more information on mobile trends, see our Tablet and Smartphone Trends page). Use of mobile-friendly technologies is much lower when presenting the Annual Report and Proxy Statements. 68% of companies are still using PDF instead of HTML/Interactive or better technologies for their online Annual Report and a dismal 90% for their Proxy Statement. It is important to note that only two companies (Microsoft Corporation and Eaton Corp. Plc) made a HTML/fully responsive Annual Report! This is a current challenge in the industry which may be facing a multi-year waiting period of becoming affordable (for a discussion on this challenge, see our article "Responsive Documents - the Best Idea You Shouldn't Use?"). High use of PDF also has some very significant disadvantages - especially on stock Apple products such as the iPad and iPhone. These stock Apple systems come with a built-in PDF reader that lacks full-text search, bookmarking, or cross-linking... failing the SEC rules and recommendations! The cost to do better than PDF is minimal, and there are current investors who use those technologies who are not even getting SEC compliant documents - so we hope that next year's study will show substantial progress towards better supporting mobile users and compliance.